Handers use soup cans in training. A dog’s resting stance is an essential piece of the judging process. Every breed has an ideal stance, but teaching the dog to maintain this position takes quite a bit of training. Handlers have come up with some pretty creative ways to train for this position, including balancing each foot on a soup can the perfect distance apart. Show dog names are hilariously long. If you’re a casual Westminster Dog Show watcher, you might know the 2015 “Best in Show” winner as “Tashtins.” What you might not know is that his full name was, in fact, “Tashtins Lookin For Trouble.” The 2006 winner, Rocky, is actually Rocky Top’s Sundance Kid. A non-sporting winner from 2018 is known colloquially as Belle, but her full name is “Bell Creek’s All I Care About Is Love.” We couldn’t make this stuff up if we tried. Disqualification is uncommon but very easy. If a dog ever bites a judge, handler, or another dog, his or her career is over. Agression is never acceptable for show dogs, especially when they are competing. Competing dogs have treadmills. As with the dog’s stance, judges consider the animal’s trotting pace. Handlers use doggy treadmills set at certain speeds to keep them used to a particular trot. This is meant to teach the dog foot timing and the right kind of gait they need to maintain a specific pace. Most handlers have lucky leashes, toys, and rubber bands. Unsurprisingly, handlers are an incredibly superstitious bunch. Some handlers won’t reuse a leash once it’s been used on a winning dog, but others will continue using winning leashes for years—even decades. Some owners also carry around special, lucky toys for dogs. The Best-in-Show cash prize is unsatisfyingly low. 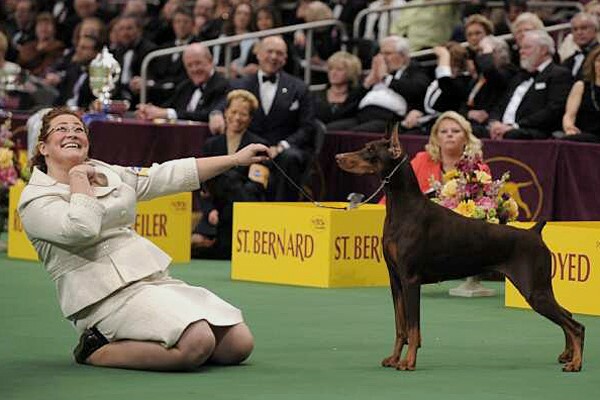 Until recently, Best in Show winners did not receive any cash prizes. They went home with trophies, a lot of swag, and potential money in the form of sponsorships. Now, these winners get to take home a $1,000 cash prize. This sum is comically low, considering many handlers spend tens of thousands of dollars raising just one show dog.